Have you checked out the excerpted Dracula article at Neptune Cafe? You’ll see the horoscope of Bram Stoker’s first public reading of his novel Dracula in London on May 18, 1897 at 10:15 am UT. Victorians thrilled to the dark psycho-sexual tale as many readers and film goers do today. There are other links between the horoscopes as you may see by glancing at the reading’s horoscope and the rectified natal horoscope of Vlad Dracula, below. Rectifying horoscopes by the dates of known life events (when a birth time is unknown) involves many hours of concentrated research and the chart I publish here is the version rectified by master astrologer Noel Tyl. It’s an Hour of Saturn which squares Uranus from its own sign of Capricorn (sign of law and government); Neptune in royal Leo, sign of the natural ruler, is atop the chart affecting his Aspirations and Goals; the Scorpio Ascendant is ruled by impaling Mars, sub-ruled by powerful Pluto, planet of death, decay, and ruthlessness. And it’s life-and-death matters for Scorpio, as you know. Chart-ruler Mars makes one Ptolemaic (major) aspect, an opposition to Neptune @18Leo21 Rx (3A48) in 10th house of Public Status, and wherever Neptune is located, things are ‘other than they appear.’ Plus, Neptune is associated with glamor, films, and acting and I’m certain that you, dear reader, have seen one or more ‘Dracula’ films in your day! His high-profile Neptune (10th h) may also pertain to centuries of legends and myths relating to Dracula which were greatly promoted early on in the West by Bram Stoker’s novel even though in Romania, Dracula is seen as a protector and ruthless warrior on behalf of his people. Impaling was his preferred method of execution, yes, a Sagittarian note (the Sag arrow impales) in his psyche, and according to Noel Tyl’s *reading of his chart, Dracula was apparently sexually impotent which may certainly cause obsessive violent behavior in strong-willed men who live in the brutal times and places that he did. Historically, I refer to the era of the Fall of Constantinople, the Crusades, and other religion-infused (or infested?) battles and challenges with other entities such as the Catholic Church engaging in just as heinous, cruel, and sadistic methods of torture and death as did Dracula. That thousands died at his hand is historical fact. The natal chart emphasis on Scorpio-Sagittarius denotes power, personal conviction, and a defensiveness that rationalized his actions via religion. The Venus-Neptune opposition (Mars conjunct Venus brings Venus, planet of vengeance, into Neptune’s rationalizing net of illusions and deceit) indicates a dangerous imagination, and his Mars-Neptune opposition shows that his motives, even if genuine, always seemed suspicious to others. Besides a tendency toward self-delusion, a lack of honesty is also shown here, and the Saturn-Uranus square signifies political (be strong at home to be feared abroad was his motto) and occult activities which supports the prominent Neptune and his Mars-Pluto Scorpio Ascendant. Of note as well is a Fire Grand Trine between Sun, Uranus, and Neptune which gave him the defensiveness this closed circuit of energies tends to give, plus, an innate self-sufficiency as a ‘law unto himself’ that allowed him to do just as he pleased while obsessed with commanding respect from others. One awful story is told of his obsession with ‘cleansing his realm’ when he gathered beggars, the infirm, and ill people of the streets into a banquet hall, fed them lavishly, then burned down the barricaded building ‘to improve the health of his State’. In fact, the peasant class of his day gravitated toward the occult implications of his membership in the Order of the Dragon (dragon = devil) so this attributed, pre-Stoker, to the historic view of Dracula as demon and monster. Not that he wasn’t! 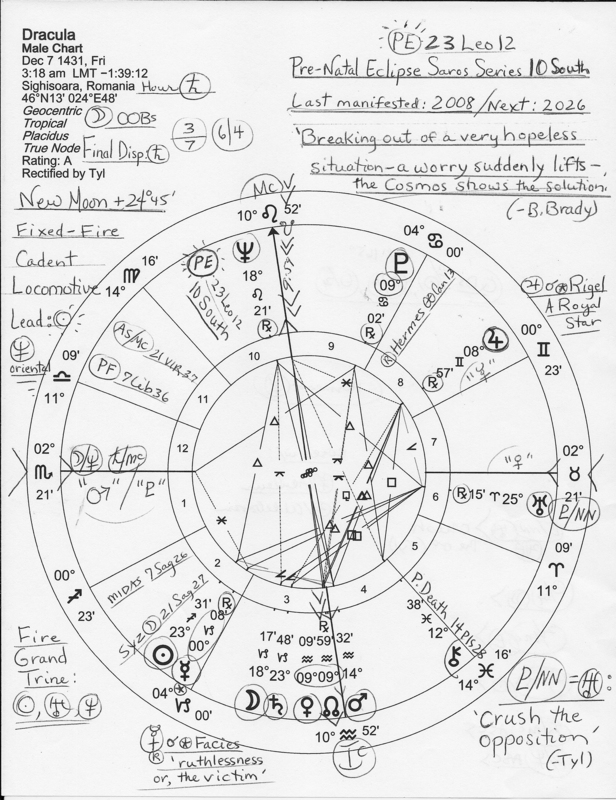 So if you click to enlarge the horoscope, perhaps you can read a few basic notes I penned on including an out-of-bounds Moon (OOBs) which denotes that from birth, the mother-son relationship was faulty-to-non-existent (plus, the Moon-Saturn conjunction in strict Capricorn.) Would having a loving, affectionate mother around in his character-building years have made Vlad a warm and cuddly adult? More reading? Live Science reports that a vampire grave site has been uncovered in Poland (video).